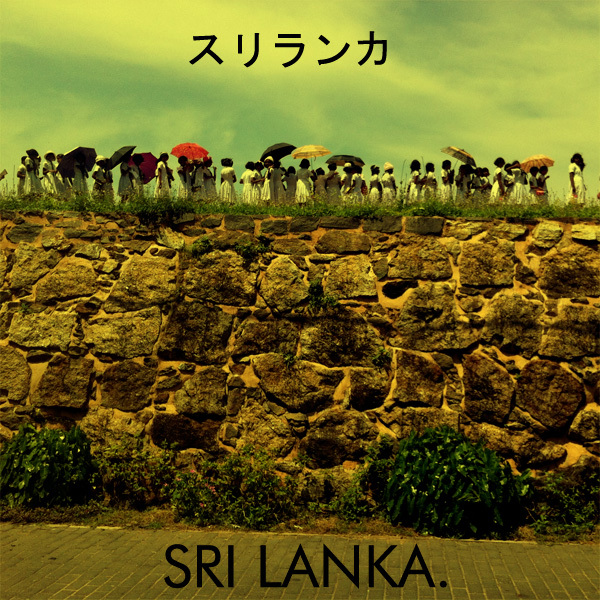 On the Salesmen of Sri Lanka | This Japanese Life. 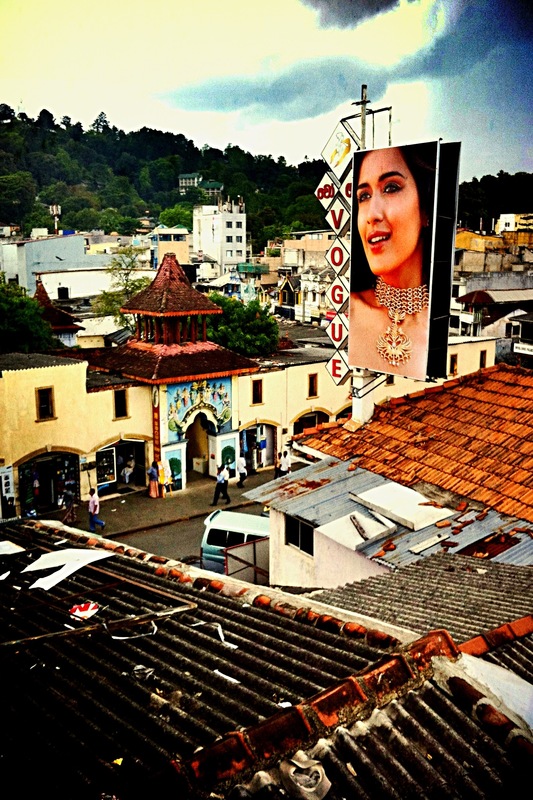 Posted on May 1, 2013	by E.
The first guy approached me while I was standing outside of a train station in Colombo, staring at the wood-and-paint schedule board full of clock faces the attendants adjusted by hand. “Where are you going?” he asked. His English carried only the hint of a Sri Lankan accent. “Leaves at 2:25,” he said, pointing at the billboard. “Gate five. You can get your ticket at the counter over here, come, come.” He gestured with his hands and started walking toward the ticket counter. We got our tickets, thanked him, and regrouped to sort out the 40 minutes before the train. One of us wanted food. “Inside, you can get food, I’ll take you,” he offered. We refused, preferring the samosas from a nearby shop. My friends went in, I stayed by the door. The man approached. “Where from?” he asked. I’d hear it a thousand times after that. “America,” I said. He asked me how long I was in Sri Lanka, what my plans were. Then he took out a notebook and showed me some hand-written English. They were testimonials from other English-speakers. “OK,” he said, closing the book. “Gate five.” He walked off. Sri Lanka gets less than a million tourists a year, a number that has slowly recovered from decades of civil war and a massive tsunami. The infrastructure still isn’t perfectly aligned with a heavy tourism industry; 50-year-old trains run along on 150-year-old tracks at 33 kph; hostels and guest houses have single copies of photocopied maps they want you to return. As tourists are arriving, a lot of opportunities are opening up for people to fill in these gaps. Sri Lanka is poor. The coast is lined with slums and people drying clothes on train tracks. Our currency was exchanged into a stack of 2000-rupee bills – about $16.00 USD – that nobody could break. A fruit stand owner gave us candy as change because he didn’t have enough bills in his register, which was a wooden tray that came out of a desk drawer. 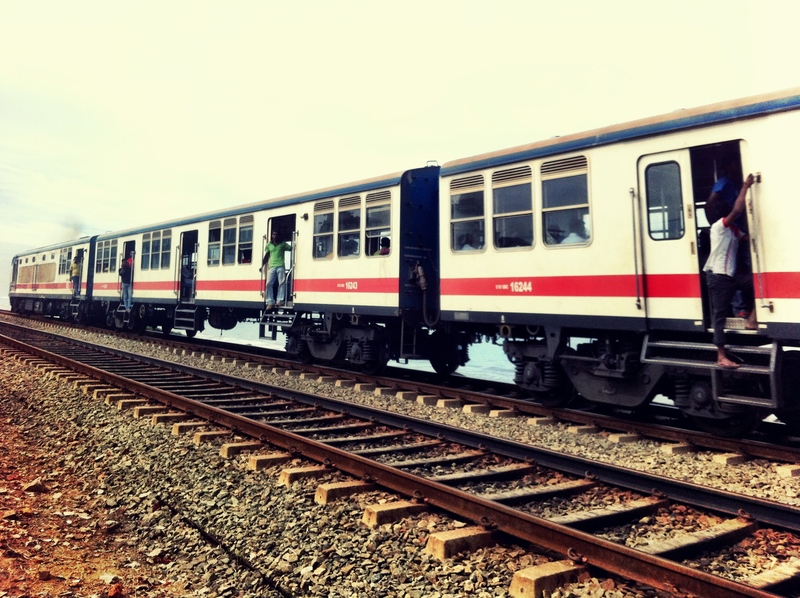 The train from Colombo to Galle has a first, second and third class section. The class difference between second and third are marked by armrests and dangerous rotating 1930’s General Electric fans screwed to the ceiling. You cannot reserve seats. We didn’t get any. Instead, we traveled with our feet dangling over the stairway outside the rail car with a perfect view of the sun setting over the calmly rippling waters of the Gulf of Mannar. The train travels so slowly that merchants come on and off the train with baskets full of traditional Sri Lankan “Short Eats” or portable fried snack foods – Vada, deep fried prawn shoved into tiny buns; Roti, a triangle of thin bread wrapped around a fish filling; dried red peppers; Samosas; a delicious falafel-esque corn and chick pea biscuit. There was a slide-whistle merchant. Another guy approached us on the train. He had a daughter in a university in China; he spoke French and German easily, his English was impeccable. A highly educated guy who seemed sincerely interested in foreigners and what foreigners could provide for him in a country where not much is provided for at all. In this case, amongst talk of his family and sons, and what he knew of our home countries, he began asking which airport we would use to leave Sri Lanka. He encouraged us to change to a new airline, from another airport, to give us more time in the country. He could find us a tuk-tuk (a three-wheeled scooter-taxi) and a driver to get us there, no problem. We booked a package deal, we said. He encouraged us to cancel. He asked where we’d stay. We said we’d booked a room. He said OK, chatted for a small bit, then politely left. The gap in official tourist channels has opened up a series of business opportunities for hostels, drivers, and travel agents; but a lack of infrastructure, promotional funds, and marketing savvy has made it very difficult to connect services to the foreign tourists who might like to use them. What’s emerged is an ad-hoc referral network, based on commissions and kickbacks to anyone who brings in any business. Tourists are big money, even when they are small money. The government recently pegged the median cost of monthly expenditures for a family of three at 46,396 rupees, or about $367 USD; a cheap meal in Kandy costs locals about 319 rupees, or about $2.25. For single people with a reasonable middle-class lifestyle, a small apartment could cost about 6,000 rupees and about 3,500 for all utilities, a total of about $75 USD. So if a street hustler can skim 2000 rupees – about $15 – off a tourist, this is worth the long effort of seduction that goes into it. 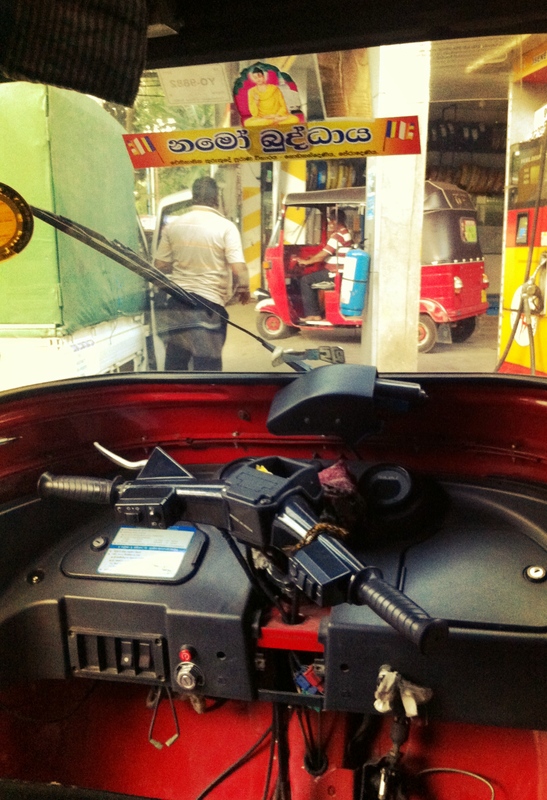 One entrepreneurial tuk-tuk driver convinced us to ditch a 180 rupee train ride to hand him 4000 rupees for a three hour journey to Colombo, 1500 went to gas and the remaining 2500 was split between the driver and the guy who found us the ride; by these numbers, with tip, we’d paid for half of that month’s rent for them both. This is all quite economically feasible and makes tremendous sense given the pressure of survival in a country fresh from wars and natural disasters. I prefer it to the passive begging of the homeless holding their hands out, and of course to whomever took my friend’s wallet full of small bills or the tuk-tuk driver who drove away without giving us proper change. These gray-market tour guides aren’t as troubling as pickpockets or con men. They are salesmen in desperate straits. The hopes of enormous, easy money, however, can muddy up the ethics. The Temple of the Sacred Tooth Relic is one of the holy sites of Sri Lanka, a UNESCO World Heritage Site, and the seat of the old Sri Lankan monarchy, as tradition dictated that whoever holds the tooth of Buddha controls all of Sri Lanka. The tooth was smuggled from India in the hair of a princess, according to legend. The tooth was carried around in different places ever since – hidden by one king in a nondescript grinding stone; hidden away from the Portuguese in the 17th century, it endured bombing attacks in 1989 and 1999. When you enter the Temple, you can enter with flowers for a small donation, if the flowers touch the ground they have to stay there, as they’re now soiled. Men and women enter in different doors before reuniting, only to segregate again into foreigners and Sri Lankans. The foreigners pay more, given that tourists are rarely there for pilgrimage and Sri Lankan Buddhist pilgrims have more decent rights to it than some blonde gap-year student from Buckinghamshire. At the approach to the entrance a man in a white uniform and a neck lanyard called us over, showed us where to keep our shoes, and told us the tour would start soon. He helped us get our tickets and held them to the end of the tour. A note on Buddhism: I am not a profound believer in Buddhism, but I was reading and meditating since I was quite young, and so I carry around the respect for Buddha that some might harbor for John Lennon, Oscar Wilde or Elvis. Gautama Siddhartha said some helpful things, things I have come to value in my life while standing aloof from the spookiness of relics, karma or the Rising Sun Kingdom. Zen Buddhism in Japan, compared to Sri Lanka or Thailand, seems almost secular, and better suited to my casual embrace. The Japanese will rarely pay much heed to ideas that a temple is radiating a magical healing power, they are not fussed with the fashion decisions of those who come to pray. My form of worship is drawn from this casual idea of Zen. I do not go to temples or shrines to wish for some reward from a God dispensing gumballs to those who plunk down coins of prayer. It’s a moment of reflection that time and practice have filled with the meaning of all previous moments of reflection. Standing at a temple I am the last bowing man, finishing a line started by the first bowing man, and leaving that line intact for whomever comes next. It connects me to a lineage of troubled minds and the common search for calming them. In the palace surrounding the relic, the guide pointed out the architecture and murals in the pathways, taking us into the temple proper. People prayed, bent to the ground, like Muslims at the call to prayer. Some chanted, some put their hands to their lips. I stood there, uncertain of how to respond to this; resisting the urge to clap twice, bow, reflect, and clap again in the Japanese style. (Eventually, I’d do that anyway, it was immensely, and curiously, satisfying). I had put the flowers down and began a moment of personal but secular Buddhist meditation in front of the tooth relic when the guide gave a “tsst” and flapped his hand at me to follow. “Plenty of time later,” he said. We went into a hallway to the altar of a large white Buddha statue. It was a beautiful room adorned with paintings and porcelain busts of Buddha in various stages of life. We were handed lilac petals and told to scatter them in front of the Buddha. Beneath the lilacs rested a careful arrangement of crisp foreign bills. It was not a suggestion. I dropped 20 rupees. The guide and the strange hallway man gave annoyed glances at each other, and my stomach dropped. This was a sham. I perfunctorily tossed lilacs but I felt cheap and coerced. The temple transformed into a cynical theme park ride for tourists watched over by two hungry carnies. They were hungry and we were rich. “It means you must pay.” His hand went out. We were in a side corner of the national holy site. I did not know this man’s connections to the temple, or to the temple guards, who had allowed him to get through the temple, had allowed him to approach the altar for the meaningless scatter of the lilacs. This was not salesmanship, this was not hustle, this was coercion. I do not deal well with coercion. “You aren’t a real man,” he said, following us as we walked away. My masculinity was questioned once or twice more, then deemed an intolerable discussion for a national holy site by some guards that came and argued, quietly, with the swindler before he walked away. Twenty minutes later, I saw him across the temple grounds, guiding around a white woman in a sarong. It seemed everyone on the street who approached me with help wanted something from it. One man pointed out a good angle for a photograph and then held out his hand. Another offered us directions to a dance performance until he saw we had tickets already, then abandoned us. We were told, in the middle of conversations about ourselves or themselves, about many places to buy amazing jewelry quite cheaply. A vendor offered us samples of his fruit and, once eaten, charged us for them. People started conversations and abandoned them once they realized we weren’t interested in what they were selling; getting up and leaving the seats next to us after being slightly too passionate about our not remembering the name of the hostel we stayed in. It seemed impossible to find an act of sincerity. It was making me angry, though I knew my anger was misplaced and irrational. Traveling offers up a lot of chances to be annoyed by collisions with totally different ways of living, different priorities and values. Every cringe and annoyance is an opportunity to flex my empathy, to try to understand where the other person lives, mentally and physically. The girls I was with shrugged it off. It was no huge cultural disparity. It’s just how most men act with women, I was told. If not most, then certainly enough to make you used to it. Maybe I’ve just never been a pretty girl before. 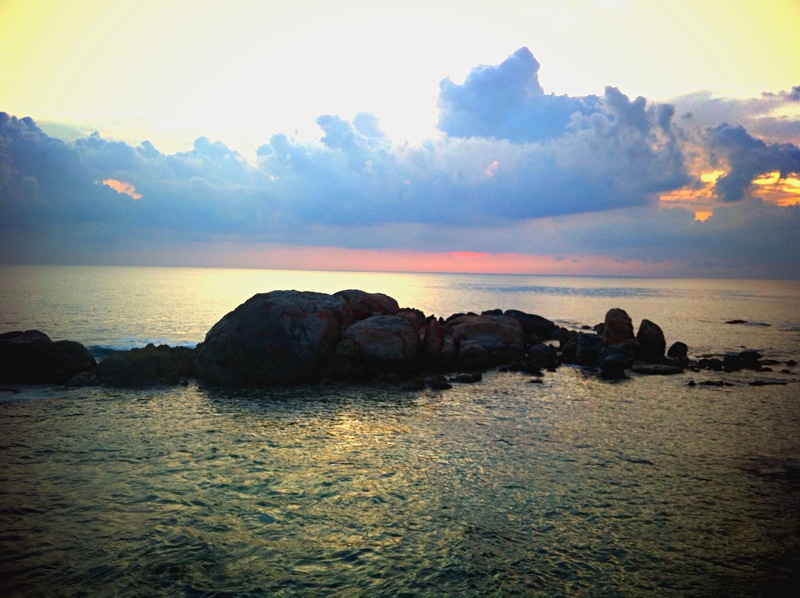 Every twenty seconds on the train from Galle Fort to Colombo, the view could stand alone as a photograph. The resulting book could have a page on the left, with the rays of sun scattering over calm blue seas, the sky pink as bubblegum; children jumping on rocks; palm trees haloed by the blue light cast by a full moon. On the right side, pictures of corrugated aluminum siding propped against tent poles for makeshift shacks; the burnt out concrete shells of destroyed homes; garbage scattered by wild dogs or monkeys across stagnant pools of water. Everyone looks to the sun setting over stones jutting out of the shore. Every face in that moment is warm and pink, but once it settles behind the horizon we all go back to having money or empty pockets. I was the last person in Sri Lanka who needed any favors. The torrent of need and want directed toward me was an exhaustion borne by my privilege, challenging and more ingratiating because it demanded a constant confrontation of poverty and my own inability – and refusal – to respond. We were on our last day in Kandy, about to take a three and a half hour journey through the cow-filled backroads of Sri Lanka toward Colombo, when we were lost momentarily. We stumbled across an Army Training Barracks and a guard in camouflage. He couldn’t give us directions – he had a hard time understanding the map, as did pretty much everybody in Sri Lanka – but he started saying something apologetic about elephants. We didn’t quite follow until he pointed at the elephant standing behind us. 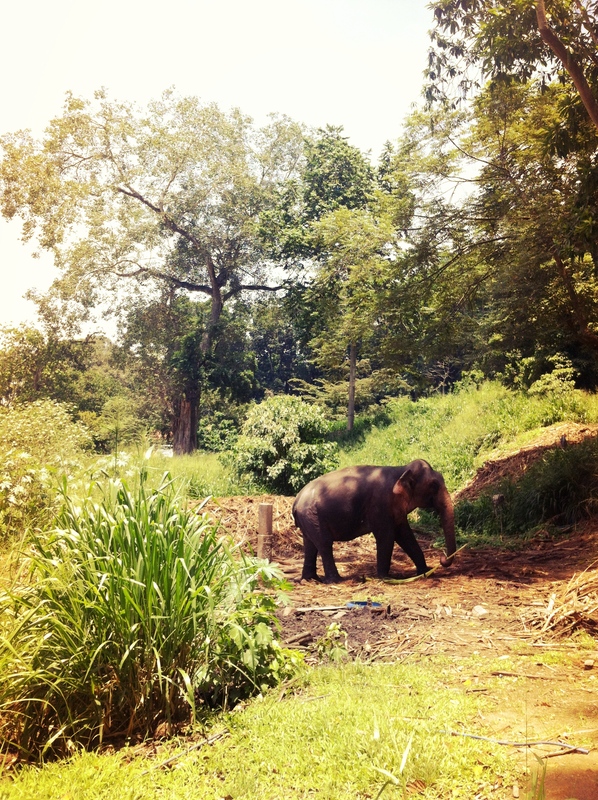 He took us to a clearing and threw a piece of branch toward the elephant. The elephant took the branch into its beak and swatted flies. The guard left as we watched the elephant, and none of us noticed his going away. Nevermind what Lonely Planet tells you! Liking This Japanese Life on Facebook is LEGIT. 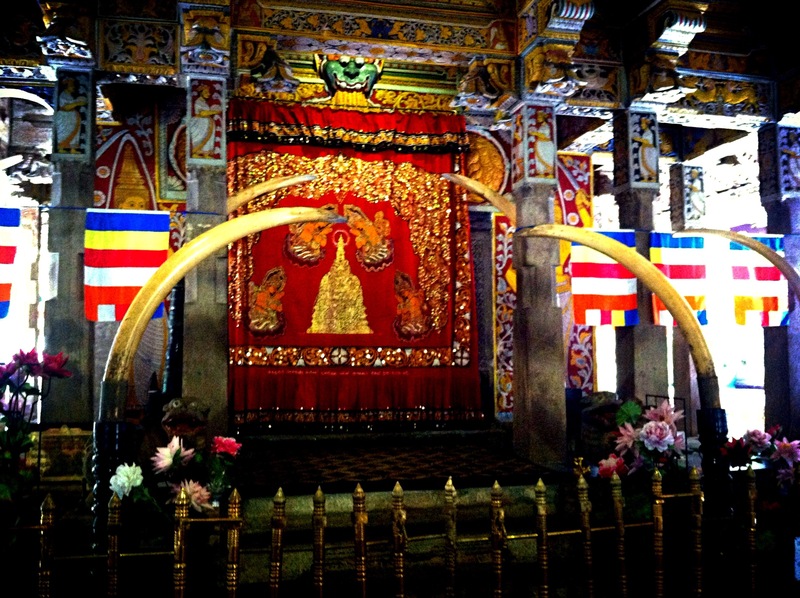 This entry was posted in Travel, Uncategorized and tagged longreads, poverty, sri lanka, tourism. Bookmark the permalink. I really enjoyed this. It reminded me of travelling to India. Feeling bad about the poverty, feeling guilty about my comparative wealth, and while trying to understand the motivations of the “salespeople”, just wishing I could walk down a street without being hassled. Everyone in America looks for a tip – like a beggar. People dont tip because they want to – they tip because they are afraid of bad service the next time around or because they are shamed into it by the staff – just like they are in Sri Lanka, it seems. I had my wedding reception in Manhattan and on top of the extortionate cost of the lunch, they wanted an enormous tip (that hadnt been discussed beforehand). They had made many mistakes during the day that i hadn’t commented on because i was happy – it was one of my wedding days. But when i politely declined to pay the tip, the maitre d raised his voice slightly, enough to alert some of our guests, and said, this is normal in NYC. I informed him that at no point was this ridiculous tip mentioned to me when we discussed costs over the phone and frankly, a tip is earned. I pointed out the several mistakes that had been made and the man was speechless. The restaurant apologised for his attitude and I was given a further discount. And this was a Michelin star restaurant! I’m from London, and many places in the city center just expect a tip and treat you badly unless you give one. Thankfully, the culture of blind tipping is only perpetuated by some stupid housewives with money to burn. The rest of us wont be coerced into it. Regarding tips in America, it is where the majority of service people’s income comes from. Restaurant servers, busboys, bartenders, etc. make below hourly minimum wage, with the understanding that this will be made up for via tips. If you received poor service, then it’s reasonable to not leave a large tip, but to leave no tip at all is actually really tacky. Expectation of a tip in America is not begging. A little research before your trip would have prepared you for this. My problem is not with tipping – it is with the tipping i am coerced into. A friend and I went to Momofuku in NYC this weekend. We had both been looking forward to eating there and it was totally worth it. The waitress took away our credits cards to split the bill down the middle and when she came back, she said the following (word for word), “I accidentally overcharged you (my friend’s card). Sorry. Fixing it would be a thing so…yeah.” And she said this as she walked away. She didn’t seem sorry and she walked away as she said it. That’s what she said – she overcharged my friend by $6 and me by $1 (randomly) and just left it because why not. She didnt think we would ask her to fix it or whatever and we waited for her to come back but, after 10 minutes, she didn’t return. So we asked for the manager, complained and our meal was free. The manager understood that she had basically done this in case we didn’t tip as many people don’t tip well after having a quick lunch. All she has done is bring our ramen to the counter. It’s poor etiquette on her part and the manager apologized on her behalf as she clearly doesn’t want Momofuku to be a place where people are randomly stolen from. And, as the federal minimum wage is $7.25, the employer is legally obliged to make up the wages of staff that don’t make that through tips etc. If they don’t,they are breaking the law as an employer. In contrast, the taxi driver stopped the meter in heavy traffic when he was taking me across town so I could make my meeting – earning himself the mandatory tip if you pay with a credit card. I had no problem with that – because he tried his best to avoid traffic and stopped the meter at one point – he didnt have to do any of that. I know this does not have much to do with what was posted, but I feel compelled to respond to what Archana said, and perhaps indirectly relates to what occurs in Sri Lanka. There is a large cultural difference between Europe and the United States when it comes to tipping, as Archana’s attitude clearly reflects, but while the custom is rarely explicitly said, it is taken as a fact. Tipping is part of this persons salary, and without it they cannot and do not make a living wage. I doubt waiters and service people of the like are paid particularly well in the UK or Europe, or anywhere in the world for that matter, but they are paid particularly horribly in the US because the laws that govern the pittance they must be paid take into account this custom, no, fact of the American service industry. As a tourist it is okay to feel weirded out by something that is different, and make the conscious decision to opt out of the local behavior, although you cannot help feeling and looking like a jackass. I suppose what is different with this experience in Sri Lanka is that these customs are not old enough to be matter-of-fact, and you have more leeway in how to respond to them. Also, these people are not employees of any business, and therefore not under any supervision or necessarily held to any standards of behavior or action. Tipping a waiter is part of their job but having money demanded from you because you took advantage of something freely offered feels wrong; how could you have known it was not freely offered unless they said something? In Britain (I can’t speak for mainland Europe as I am not sure how strictly minimum wage is enforced in countries like Italy – in Germany it’s there for sure), everyone is paid minimum wage (although I am sure there are many people who don’t and they only get the job because they don’t say anything) and London staff are given the London hike up to accommodate travel and more expensive living conditions. I had a spa day recently – i negotiated a price with the therapist (because everything is way way over-priced once you leave NYC) and she agreed that it was a good deal. The service was good and now i will be a regular customer. She didn’t expect a tip and I didn’t give her one. I recommended her services to an entire organisation – and she is inundated with business. I didnt ask for commission – why should she get a tip? It is less surprising for someone trying to make money from a tourist in a poor country (as this makes sense – it’s hardly something to be surprised about – they know you have money because you could afford to fly to the country and stay in a hotel). I think it is hypocritical middle-class morality to be shocked at scam artists in a third world country but justify tipping because the government in America has decided to pass an invisible tax onto the consumer to help the restaurant industry. The custom of blindly tipping in America isn’t really that old – Americans were generally against it in 1890 and minimum wage was only established in 1938. Waiters in Sri Lanka, and hotel/guesthouse staff don’t get paid that much – i dont know if there is a minimum wage but i doubt if they get paid well. I wonder how many tourists tip them? Sri Lankans – who would never ever think of tipping anyone in Sri Lanka would blindly tip in USA – lest they be chastised by their peers for caring about the plight of the service industry worker in America, a supposedly developed country. *sigh* That said, I always tip taxi drivers at night. I think its a thank you for making me feel safe and comfortable in a moving vehicle driven by a stranger, getting me to my destination quickly and stopping in the first place (they are like a white knight, helping me to safely get home). This story really felt like the trip we made to Sri Lanka last year.. We went for an all inclusive with private chauffeur in the idle hope to taste some local dishes at small family restaurants and go off the beaten track. Shame… onliest thing we found out that Buffet is the onliest dish around (kickback from the restaurants was a free mail for our chauffeur). Everybody refers to everybody and the kickbacks are indeed being paid depending how much the tourist has spent. Really didn’t like when they take your hand and start babbling about you will get 3 kids and live to the age of 99 and expect money for that or when you hire a guide and midway an accomplish comes around to voluntarily help you…. yeah.. they get pissed off when you refuse. Well I might have hesitated to wish crippled people would avoid the bridge I was walking on for the sake of my romantic vacation. On every trip to a developing country we should best presume we will be encountering poverty. It is their country and we are guests in it, so I do think we have to respect the role we’re given. Is it an annoyance? Sure, but so, I’d say, is the homeless man’s arm injury… ? I am a bit disappointed to read this article. My husband and I really want to go to Sri Lanka next year but I can’t stand places where people are constantly wanting “tips”, and I feel I can never relax and interact with locals as they will probably want some money. Have you been to Vietnam? Behaviour like that there made me end up hating the country. I would love to know how it compares, although if it’s not as bad as India perhaps it is ok, as I find India fine.